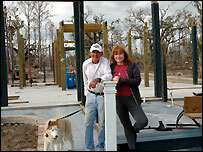 Some people describe the town of Waveland as Hurricane Katrina's Ground Zero. Once a hidden jewel of the Gulf Coast, it wasn't so much hit by the storm, it was flattened. Three months on, its population of 7,000 has dwindled to about 300 people. Many of these are camped out on the ruins of their dream homes. The town is not just fighting to recover, it is fighting to exist. Brian Schmidtt is a parish alderman, working in one of nine portable buildings that now make up the city hall, police station and fire department. "It was very nice here, very laid back," he says. "It is still a place where practically everybody knows everyone. "That's one of the difficult things, to see everybody leaving and not know whether anyone's going to come back." Just 50 miles down the coast from New Orleans, it is an old community popular with those retiring from the Big Easy to a quieter life by the sea. In recent years, it had welcomed more young families, drawn by jobs at a local plastics factory or at Nasa's Stennis Space Center, America's largest rocket-testing facility. But the town is no longer a place for children, and many of the remaining residents feel like the world is forgetting them. "Waveland is being somewhat neglected," says Brian. "It is just a very small dot on the map, but there is no place that is more devastated than here." Dan McManus, 67, stands on a concrete slab that was once the floor of the home he built for him and his wife Susan to live out their retirement. The former construction worker, who served in the US Marines for 10 years, has been clearing his land, ready to rebuild. The plots either side are a mass of twisted metal and broken timbers. The contrast shows how much he has already achieved, but is also a sign that many people have simply moved on. "This is Katrina's Ground Zero," he says. "When you look at the rubble, it is total devastation. Everything south of the railroad tracks is just gone. "But this is my future, I have nothing else to do. All I have is time, and I used to build houses, so fortunately I can do this. "But what about people with no money in the bank and no skills and $100,000 mortgage on a house that no longer exists?" Before he retired, Dan worked in insurance, and he fears he will have trouble getting compensation. The biggest argument for him and others is over what caused the damage - hurricane winds, or the 50 ft wave that tore through Waveland's oak-lined avenues? For Larry and Frances Fuselier the question is almost irrelevant. They had just finished building their house before the storm hit. They were uninsured and are left with nothing. The government has given them a cheque for $10,000. Their house may have been worth 100 times that. Their mail box by the roadside is about the only thing still standing for 50 yards. 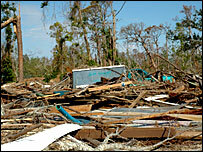 Frances has scoured the surrounding area, but can barely find traces of the house, let alone any of her possessions. "I don't care about the antiques or the fixtures and fittings - it is the family photographs that I miss," she says. Larry, 70, has declared himself "unretired" and vows they will start again. He has erected a white picket fence around the Fema trailer the couple share, and has bought a dog-house for his Siberian husky. A well-known athlete in his younger years, Larry has run 150 marathons, and talks like someone who knows about endurance. "No one could have lost more," he says. "Look around, this will not be back in my lifetime, but what should we do? We can't just give up." It is not the first time that Waveland has been devastated. It was torn apart in 1969 when Hurricane Camille smashed into the Gulf Coast. Then the town took decades to get back to where it was. Now it faces another long road to recovery. Hurricane Katrina was the most expensive natural disaster in US history - displacing over a million people and leaving close to $130bn of damage. Tommy Kidd, 66, is a Waveland restaurant owner, and, like others, is frustrated by the slow pace of bureaucracy. "Our civic leaders are still in a degree of shock," he told the BBC. "In a small town like this they were totally unprepared for the hurricane. "That's not surprising, but to begin to get back on our feet we need to be able to cut through the red tape, not hold meetings and talk about where we want to be. "It's about making things happen."